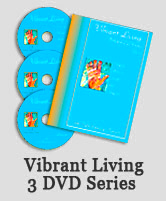 Vibrant Living is the proactive journey for creating radiant health and longevity. In an easy-to-read format, this book is the total mind and body wellness guide, complete with detailed exercises and dietary plans that will illuminate your path to radiant health. This book is a compilation of the author’s work in the fields of alternative health and natural healing – it’s the next big thing to having a personalized consultation with Sally! Learn how to manage and reduce stress, uplift your attitude, understand the cause of your current health situation and reverse the effects, choose exercises and therapies that will enhance your radiant health. Receive shopping guides for food and supplements, and diet plans including the junk food wean menu, the health and longevity menu, the sensitive stomach plan, and the weight reduction menu. Be prepared to be elevated and inspired! 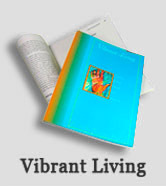 “In Vibrant Living, Sally Kravich draws from her own personal sojourn and shares with the readers the knowledge they need to illuminate the individual path each can take to achieve vibrant health.” Dr. Jane Greer Therapist, Author, Red Book Magazine.com Columnist “Vibrant Living is a must read – Sally teaches us to exit the vicious cycle of poor self care leading to pre-mature aging, and break into the healing cycle of life with quality thoughts, attitude and food! What makes this book unique are the detailed exercises designed to help people eat more consciously to rebuild our bodies, manage and reduce stress, and create a longer, brighter future.” Dr. Nita Vallens Host, Innervision radio show on KPFK Los Angeles, 90.7 FM “Vibrant Living is the road map for those seeking the path to total well-being, with Kravich as their personal guide, helping them to avoid all the modern-day pitfalls and reap the benefits of radiant health for keeps!” Mikki Taylor, Beauty Director and Cover Editor, ESSENCE magazine A former actress, choreographer, and professional dancer, Sally still maintains her SAG/AFTRA membership and frequently appears on television and radio programs, speaking on topics of natural health, nutrition, and wellness.